In V3.3 the Auto Pulse feature was improved with a progress bar. Many thanks to the Spot Welder user Arturs Jelohovskis for implementing this feature into the Arduino code. The Arduino Code is available at GitHub . For updating your Spot Welder check out the Software Update Tutorial. added indication of delay AFTER the welding pulse as progress bar. 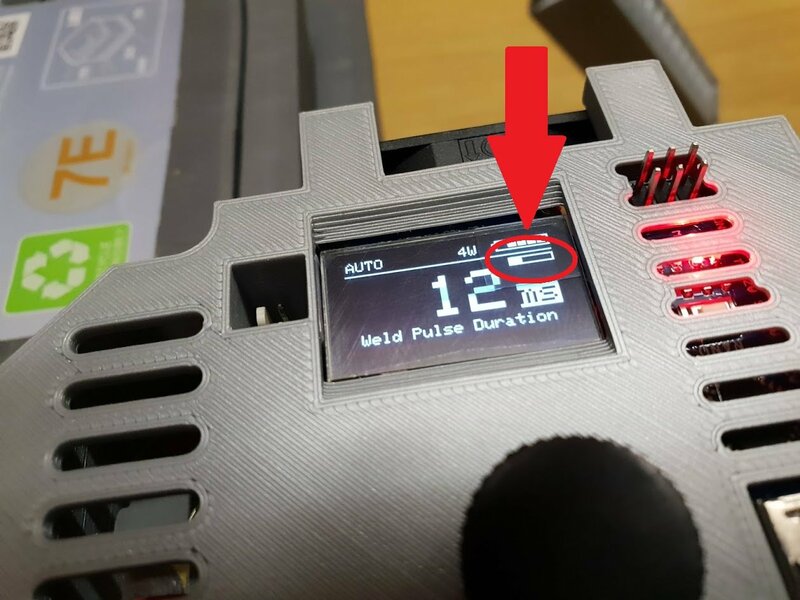 If you now use your Spot Welder in AutoPulse mode and touch the nickel strip with both welding tips a progress bar will appear on the screen. This bar will fill up in the time that was set for the AutoPulse delay (default 2 seconds) and then the weld pulse will be activated. If you remove one or both welding tips from the nickel strip while the progress bar is filling up the weld pulse will be cancelled. After placing the welding tips on the nickel strip again the bar will start from the beginning again. In manual mode the bar will be displayed after the weld pulse was activated to indicate the wait time until the next weld pulse can be activated. I have a question if you can get the HEX file to this welding machine, I do not know about arduino and unfortunately I can not translate these files to IARDUINO, but I can program the ARDUINO-NANO processor in the ISP 6-pin input and I mean the HEX file with this oled display. I dont know if a HEX file can be generated with the Arduino IDE. How long is the waiting time between the autopulses usually? In my case it takes about 20 seconds from the pulse until the next activation of the progress bar comes again. Even though I have set the AutpPulse delay to 0.5 seconds it also takes here about 5 seconds until the pulse comes. What could be wrong? Usually the wait time on autopulse is only the set delay. It means if you set the delay to 1 second the welder should activate the pulse after 1 second, then after the pulse wait 1 second and then you can do the next pulse. 20 seconds or even 5 seconds is way to long, then there must be a problem with the Arduino Nano. how do you get me a step by step to write how to upload to druino nano, and here I have to ask if this file V3_3.h can be loaded directly with the 6-pin ISP entry into arduino nano, or do you need to do it through the arduino uno tile? i still have a question about the display i have (Address-Sect 0x7A and 0x78) where should it possibly be changed? Did you use the display library version 1.1 like in the tutorial ? With the new version of the library there seem to be some problems. Maybe this causes your issue.